In a judicial first, a District Court in New Zealand has imprisoned a person for disobeying orders of the Environment Court. 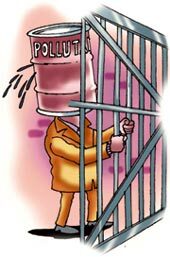 William Victor George Conway was sentenced to three months of imprisonment for disobeying court orders asking him to cease causing pollution. He had earlier pleaded guilty on behalf of his companies, Cash for Scrap Limited and Millennium Investments Limited, of disobeying court orders in relation to discharging contaminants from a metal recycling site in Otara. The pollutants included battery acid, fuel, glycols, oil and metals. The Auckland Regional Council (arc) contamination control team discovered the offences. The initial incident that led the arc staff to the site was when 14 drums of 200-litre capacity, containing waste engine oil, and three 50-litre drums, filled with paint solvents, were deliberately punctured on the site. Consequently, the wastes leaked and entered a stream which flows into the Tamaki estuary.